Hal does some Box Stacking’ while playing Amazing Frog? It had been quite a while since we had managed to make a video. 0.2.5 (and the quick fix 0.2.6) was such and intensive breaking and remaking process that seemed to drag on forever. But you can’t make an omelette without breaking some eggs, and while the Fayju kitchen was a mess for a while, I’m pretty sure we made some massive optimisations in our process and how it runs which will help us make Amazing Frog? get better and better. Now we’re back where we wanted to be and also I’m pretty confident 0.2.7 will come out within a week and we already know what we have lined up for the next few updates. We’re totally exited about them too. but we felt like we ran too fast into such activities on OUYA and it didn’t work out how we had intended. What we have planned on Steam Early Access is so so much bigger. We want modes too, modes you can just turn up in Swindon and challenge yourself to do and we are testing all sorts of mechanics from the party based ones with balloons to the challenge or confrontational. But we want to get them right and we want the surrounding game environment to be right too. In the mean time this is a video about how we set ourselves our own challenges, some of the fun we have is literally coming up with stupid things to do. 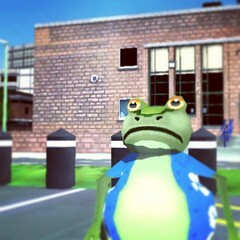 We love playing Amazing Frog? I mean we love getting eaten by sharks or blowing them up or causing massive physics pile ups and getting mad air of course… but some times, its fun for us to just hang out in the hideout and mess about with the frog system in a more chilled way. Box Stacking’ is not easy.